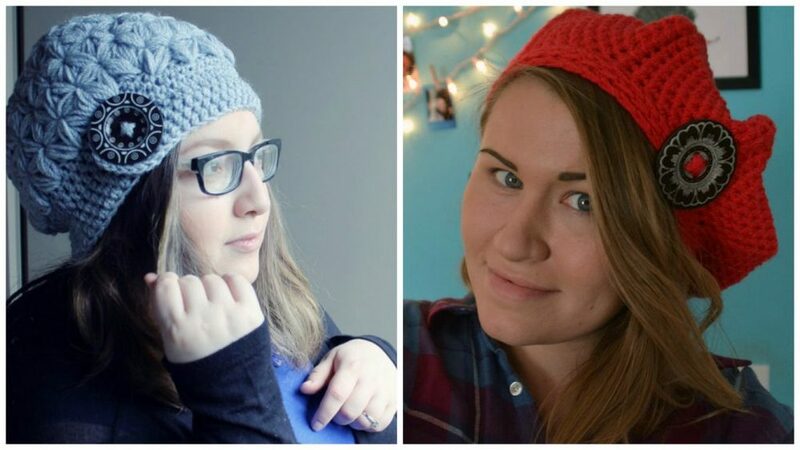 Today, we're reviewing our new favorite Etsy shop: FullaBeanies! Based out of England, shop owner Janet aims to provide fashionable, modern versions of crocheted hats (as well as patterns to stitch your own). KATHRYN - I chose the star puff slouchy hat in a gray color with her beautifully big, trademark button. The stitching is gorgeous and absolutely intricate! This style keeps my head (and ears) warm, perfect for winter. Janet got her start when she began crocheting three years ago while her husband worked late nights and she looked for a hobby to keep her company. After creating a few birthday gifts and being requested to make more, Janet decided to open up an Etsy shop for anyone who wanted one. Each hat is made from 80 percent acrylic and 20 percent wool. If you have a custom design that you'd like (not found in her Etsy shop), you can place orders through her Facebook page or Twitter. EMMA - I chose the ribbed beret in red. I always need a cute, fashionable beret or beanie to snuggle up in during cold weather. I absolutely love the romantic pop of red this hat is made of, it's a great warm, bright color for cold and dreary weather! The crochet is excellent and I couldn't find a single flaw with the stitching. It's beautifully made--you can tell a lot of Janet's knowledge and hard work goes into each hat. The hat's style reminds me of something Rachel on "GLEE" would wear! It has a very vintage feel but still looks young and refreshing. I can't wait to style this with a cute trench coat, skater skirt and thigh-high socks! I'm currently wearing it with a flannel and it's expertly hiding my after-work messy hair. To learn more about Janet and her wide range of products, visit the FullaBeanies website and her Etsy shop. *This is a sponsored post. We were so pleased when shop owner Janet approached us about reviewing her FullaBeanies products and are SO glad we did!